Custom Dual Magnetic Clips Personalized in Bulk w/ Full Color Imprint. Heavy Duty: Hold 25 pages. Promotional, Inexpensive. Best Price in USA, Canada. Prices include full color custom imprint (unlimited number of imprint colors, or a color photo). We also supply blank (not imprinted) Dual Magnetic Clips for $1.09 each (minimum quantity: 250). Production Time: 7 days after art approval; 3 days rush production is available: contact us. Blank magnetic clips ship next day. 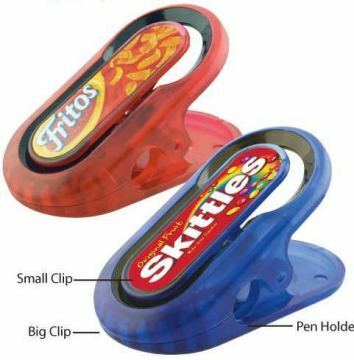 An upgrade to the standard magnetic clip features a second clip located on top of the first. Colors: Translucent Red, Blue or Solid White with Black Trim.